JUMANJI: WELCOME TO THE JUNGLE is a most fun and hilarious new year treat! This film brought me the most LOL moments I’ve had in years. It’s light and very entertaining. Scheduled here in the Philippines for a late release this week due to the Metro Manila Film Festival (MMFF), “JUMANJI: Welcome To The Jungle” took off during the holidays in other parts of the world with a more than a “satisfactory” rating and I finally know why. This sequel to the 1995 original film which starred Robin Williams, Kirsten Dunst, Bonnie Hunt, Bradley Pierce and David Alan Grier is nothing short of a riot. There’s also a little tribute there to Alan Parrish, the character of Robin Williams in the first film. 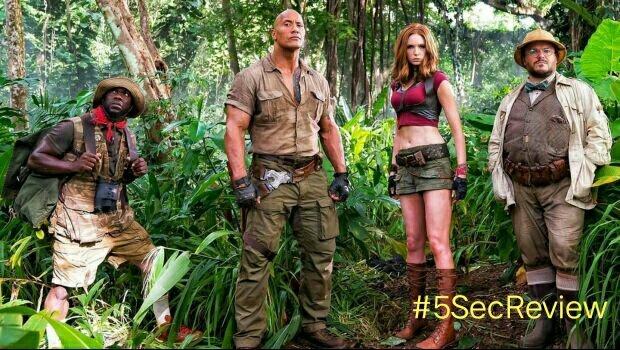 “Jumanji: Welcome To The Jungle” may not have a story that’s original and Oscar-worthy but it is one helluva funny and entertaining film. Praises to all the lead cast Dwayne Johnson, Kevin Hart, Jack Black and Karen Gillan. Their chemistry in this film is just so hard to unnotice. Almost every line and situation are hilarious. You just can’t help but laugh every time Kevin Hart opens his mouth and Jack Black playing a self-absorbed social media addict teen high school “princess” is gonna be one for the books. Directed by Jake Kasdan, JUMANJI: WELCOME TO THE JUNGLE is definitely a fun movie to start the new year! I give this a 4/5 for LOLs.